Hi everyone! It’s Kimberly, and I can’t wait to share our best news ever! I think you will agree that it is some of the most exciting news ever! 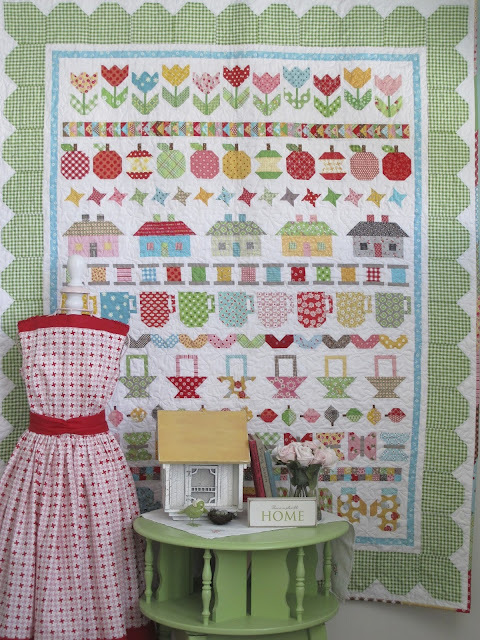 First, you should know how much I heart Lori Holt of Bee in my Bonnet. I envy the amount of creativity she has in just her little quilty fingers, but she is such a wonderful person I can’t hold it against her. We did her Row Along last year and it is my favoritest quilt ever, right down to the signature bumblebee block! After I visited her in Utah a few months back to do some video tutorials with her, I talked about her non-stop to anyone who would listen. I still am! Every Bee in my Bonnet blog post continues to dumbfound me with awesome-ness. So… we’ve followed the age-old adage. If you can’t beat ‘em, join em! 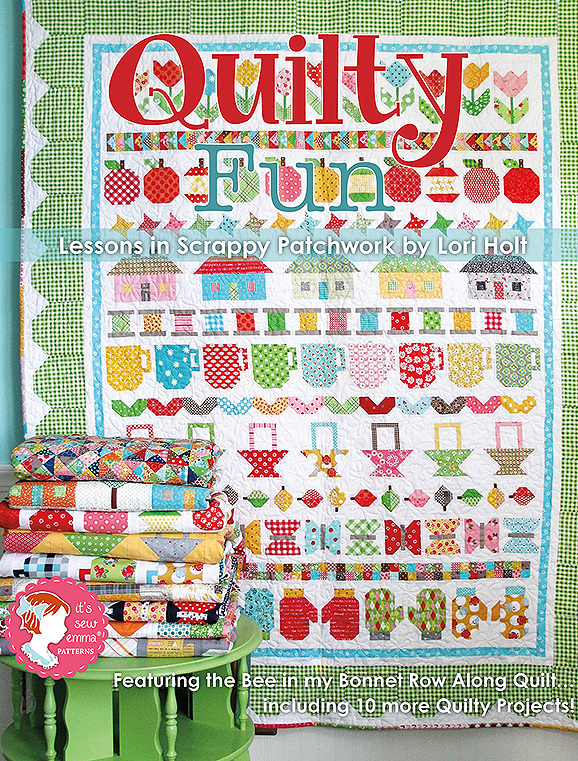 We have partnered with Lori Holt to publish her very first book, Quilty Fun! 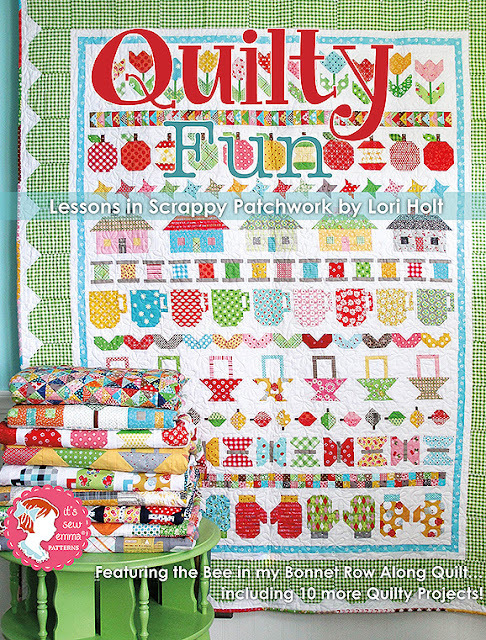 Quilty Fun: Lessons in Scrappy Patchwork contains the COMPLETE set of instructions for her full Bee in my Bonnet Row Along Quilt, plus 10 brand new coordinating projects using those adorable blocks! 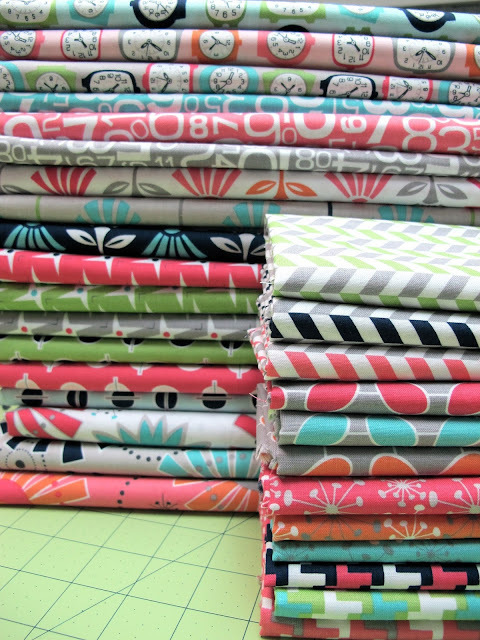 The projects are quilts and other beautiful things for your home, like pillows, tablerunners, and even a sewing machine cover! There, you see? Aren’t you dumbfounded too? Quilty Fun will be spiralbound (like a recipe book) so it is durable and will lie flat as you use it over and over again – no splitting spines here or using your pincushion as a paperweight! It also contains tons of tips and inspiration from Lori. Are you hooked yet?? If so, we have the book on pre-sale starting today – right now, in fact! Scoot on over to Fat Quarter Shop to pre-order your first-edition copy at 20% off of the $27.95 retail price! Our pre-sale will end when the book is here in September/October, so don’t wait long. You will also receive a bookmark signed by Lori Holt, and she is also hosting a Gracie Girl giveaway on her blog THIS WEEK ONLY for anyone who pre-orders it! 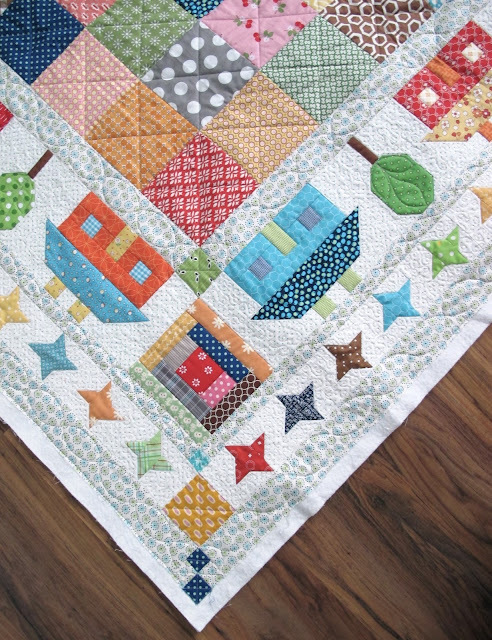 I just want to sign off by saying how incredible it is to work with Lori… Thanks for this monumental opportunity to work on Quilty Fun with you! We love every minute of it!